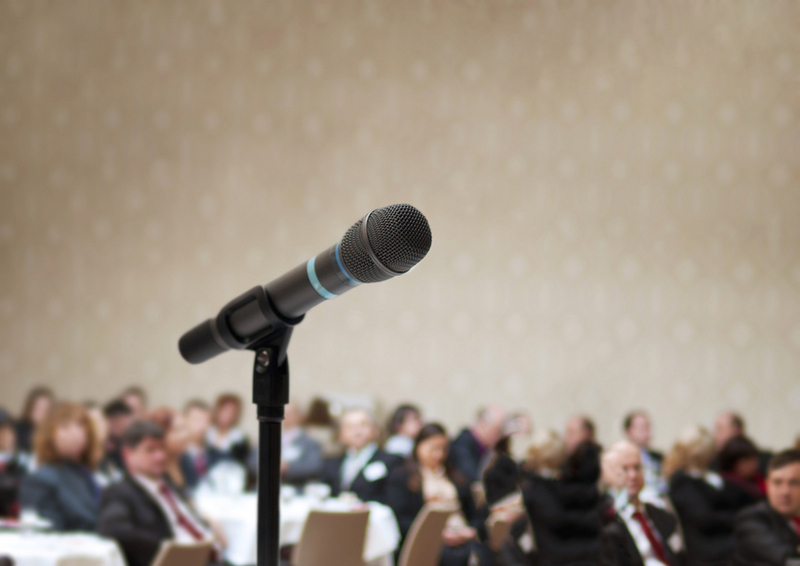 Are you confident about using microphones at your events? Here are some microphone tips from the pros. How Do I Hold a Microphone? Hold the microphone in front of you, pointed at your mouth, about 4-6 inches from your face, and about an inch below your mouth. You want to talk into the microphone, so it can pick up your voice loud and clear, but you don’t want to breathe directly into the mic to avoid heavy breathing and the annoying plosives - the popping sound when you say “P” and “B” sounds with a puff of air. We’ll cover those pesky on-off switches a bit later. Again, make sure the mic is about 4-6 inches away and about an inch below your mouth. Try not to turn your head too far away from the mic as you reference your slides or look around the room - you still need the mic to pick up your voice to be heard by your audience. Don’t talk too far away from the mic, but also don’t talk right on top of the mic. If you’re up too close to the mic, you may hear distortion and clipping from the mic being overpowered by your voice, especially on plosive sounds. If you hear distortion, back off the mic a bit. If you’re using a lavalier microphone (the kind that clips onto your shirt), make sure it’s high up and centered on your chest, so that it picks up your voice over the room noise. You want to make sure that it can still hear your voice if you turn your head and that you won’t suddenly change volume as you move. If you wear it on one side, put it on the side you’ll turn towards to face the screen. If you’re using a headset or an “earset” (a headset that clips to only one ear), make sure you position the mic element so that it’s just off to the side of your mouth, so that you don’t get breath noise or plosives, but still close enough to hear you well. Make sure the headset or earset is securely attached to your head, and, if appropriate, clip or tape the cable to your shirt so that it doesn’t pull on the mic. With any wireless body-worn mic, make sure you clip the mic transmitter pack (called a “belt pack” or a “body pack”) to your belt or put it in a pocket, taking care not to pull on or put strain on the microphone cable. What is that awful squealing noise? Feedback - we’ve all been to a meeting where the microphone squeals and screams, making the whole room cover their ears and wince. Feedback occurs when the microphone picks up the sound from the speakers more than the sound of the person speaking. This can occur because the mic volume is too high, because the person with the mic walks in front of the speakers, or because the microphone is being held in such a way that it picks up too much room noise. Don’t point the mic at the speakers. Make sure the person speaking is louder to the mic than the amplified signal. Don’t cover the mic with your hand. That last rule is a bit counter-intuitive - you would think that covering the mic would make the feedback go away, but in fact it can make feedback worse. Most microphones used at events are directional - they pick up sound in front of them, and reject sound in back of them. If you put your hand over the top of the mic, or cover part of the windscreen “rapper-style,” you can turn a directional mic into an ominidirectional mic - one that picks up sound from any direction. This is a great way to make feedback happen; unless you want feedback, don’t cover the mic. If you need to make a comment off-mic or walk in front of a speaker, mute your mic instead of covering it. All wireless microphones have a switch of some kind, but every brand of mic is different, so the mics at your event may have a slightly different interface. But no matter the brand, there will be a switch labeled “Power” or “On/Off”. If it’s a toggle switch, flick it on. If it’s a push button, press and hold for about 3 seconds until the screen and lights turn on. Most mics take between 1 and 3 seconds to power on, so turn the unit on, and wait a few seconds before you talk. On mics with a push button, a long press and hold usually turns the unit on and off. Often, a short press mutes and unmutes the microphone. On these models, the light is often green to indicate “on” and red or amber to indicate “mute”. On models with only one color of light, there is usually a small text indicator on the LCD screen on the mic transmitter to indicate mute status. If there’s a sound operator in the room, he or she may ask you to leave the mic transmitter on all the time and allow him or her to unmute the mic remotely when you begin your presentation and mute it for you when you come offstage. If you turn off your mic manually, the operator won’t be able to remotely turn it on again, so make sure you leave the transmitter on and unmuted if that’s what the technician asked when they gave you the mic. If you’re using a gooseneck mic at a panel discussion or lectern, there may be a push to talk button. Many of these mics are Push-On-Push-Off, meaning you push the button once and let go to turn it on, and push again and let go to turn off after you’re done using the mic. If that’s the case, make sure you turn off your mic after you speak to avoid picking up rustling paper or any side comments you make. Often these mics will have a light on the mic or the base to indicate the mic is on. If the mic is Push-and-Hold to talk, press the button and keep it pressed as long as you are speaking, then release the button when you’re done talking. I’ve covered the major types of microphones you’ll encounter at events, so with this guide under your belt, you should be ready for your next meeting. Just remember the basics - the mic has to pick up your voice, and avoid picking up the sound in the room. Avoid plosives and feedback with proper mic placement, and take note of your on-off switches. Now you’re a microphone pro! We promise not to share your email with anyone, and we won't send more than one email a month, even if we post more often than that. Newer PostYou want how many microphones? Older PostWhat Causes Audio Feedback?